CAPE CANAVERAL, Florida -- There will be a Full Moon tonight, Monday, June 20, 2016. But not just any Full Moon. This Full Moon is a Strawberry Moon that also happens to occur during the Summer Solstice - an event that has not occurred since 1967 and will not occur again until 2062. Tonight's Strawberry Moon begins with a moonrise over the Atlantic Ocean on Florida's east coast around 8:34 p.m. Eastern Daylight Time on June 20, 2016 (with plus or minus a few minutes depending on your exact location along Florida's east coast). The moon will be at its fullest (99.8% full) the following morning at 1:12 a.m. Eastern Daylight Time on Tuesday, June 21, 2016. The Strawberry Moon will set at 7:33 a.m. Eastern Daylight Time on Tuesday. Why is this Full Moon called a Strawberry Moon? According to Native American folklore, a full moon in June is called a Strawberry Moon because the short season for harvesting strawberries comes during that summer month. Other names for the first full moon is June are Rose Moon and Flower Moon. Sometimes. But Strawberry Moons are not necessarily red or pink in color just because they occur in June. 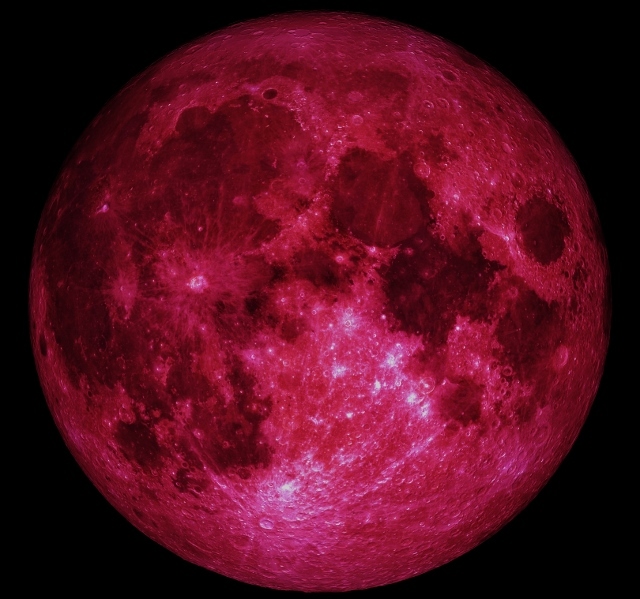 Like any full moon, the moon can appear reddish-pink which is caused by atmospheric conditions on Earth or a partial lunar eclipse. Strawberry Moons can also appear brown-red in color during a total lunar eclipse. More than likely, the Full Moon on June 20, 2016 will appear the usual pearly-gray to most locations on Earth. The Summer Solstice is the shortest night and longest day of the year on Earth's northern hemisphere for locations like Melbourne, Florida, but the reverse in the southern hemisphere for locations like Melbourne, Australia. During the Summer Solstice, the Sun sits above the Tropic of Cancer, spreading more sunlight in the north and turning the tables on the south. However, it is not the Sun that is moving north or south through the seasons, but a change in the orientation and angles between the Earth and its nearest star. The axis of the Earth is tilted 23.5 degrees relative to the Sun and the ecliptic plane. The axis is tilted away from the Sun at the December solstice and toward the Sun at the June solstice, spreading more and less light on each hemisphere. At the equinoxes, the tilt is at a right angle to the Sun and the light is spread evenly. A Summer Solstice can occur on June 20, 21, or 22, depending on calendar events such as leap year and when the Solstice begins relative to Coordinated Universal Time. In 2016, the Summer Solstice, will occur on Monday, June 20, 2016 at 12:38 Eastern Daylight Time (22:34 Universal Time), according to the U.S. Naval Observatory. Several celebrations going back to primitive times center around the Summer Solstice because the apparent change in location of the Sun and Moon marks important dates for hunting and farming as evidenced by the astronomic architectural designs at Stonehenge in England and Mayan and Aztec pyramids in Central and South America. In modern times, International Surfing Day - a very sunny sport - is celebrated on Summer Solstice. How can the Summer Solstice be the First Day of Summer and Midsummer at the same time? The difference lies in the definitions created by culture, agriculture and astronomy. According to NASA and astronomical institutions, June 20th marks the beginning of Summer in the Northern Hemisphere and the beginning of winter in the Southern Hemisphere in 2016. The official start and end of summer can vary by country - not because summer starts a week or so earlier in one country than another in the same hemisphere, but because the recognition of the start of summer is often influenced by historical or cultural reasons particular to that country. Most countries recognize summer as starting on dates ranging in May and ending sometime in August. Although the June Solstice marks the beginning of Northern summer, it is often called Midsummer. In traditional Gaelic culture, the Summer Solstice represented the mid-point between the commencement of the Celtic Summer on May 1 and autumn on August 1. But I thought June, July and August were the Summer months? They can be if your culture or country recognizes those months as summer. In the U.S., those months have become associated with summer because school vacation (a.k.a Summer Break) has traditionally taken place during those months. But the choice of those months were influenced by the agriculture harvest seasons to allow children to help on the family farm and not due to the official beginning and end of the summer season. Why is there a lag time between the hottest days of Summer and the Solstice? Blame the oceans, which heat up and cool down only slowly. By June 20 they are still cool from the winter time, and that delays the peak heat by about a month and a half. Similarly, in December the water still holds warmth from the Summer, and the coldest days are still (on the average - not always) a month and a half ahead. The 2016 Summer Solstice marks the highest exposure of the northern Atlantic and Pacific Oceans to the Sun's heating radiation. The rise in ocean temperatures then provides the energy necessary to produce stronger hurricanes later in the year, usually around September.